Global coral reefs cover 1% of the Oceans, with 25% of Marine species and 500 million people rely on these natural wonders, but reefs are impacted through climate change. Reef conservation requires consistent habitat maps, however there is no single map created consistently, describing geomorphic zonation (e.g. slope, flat, rim) or bottom composition (e.g. coral, algae, sand) over the full extent of the world’s coral reefs. RSRC component of the project involves developing and implementing a cloud processing object-based mapping and modelling approach to produce maps of geomorphic zonation and bottom composition. Maps and approach are based on previous RSRC research on the Great Barrier Reef and other reefs in Asia Pacific. The global mapping approach will modify our previous method with higher spatial resolution Planet Dove images and be applied on a global region by region basis. The international project is the result of a collaboration with Paul G. Allen Philanthropies for support on funding, development, communication and management; Planet for global imagery and processing; the Carnegie Institution / Arizona State University for water column correction and monitoring protocol; the National Geographic Society lead global engagement and verification activities; and Remote Sensing Research Centre for the actual mapping. 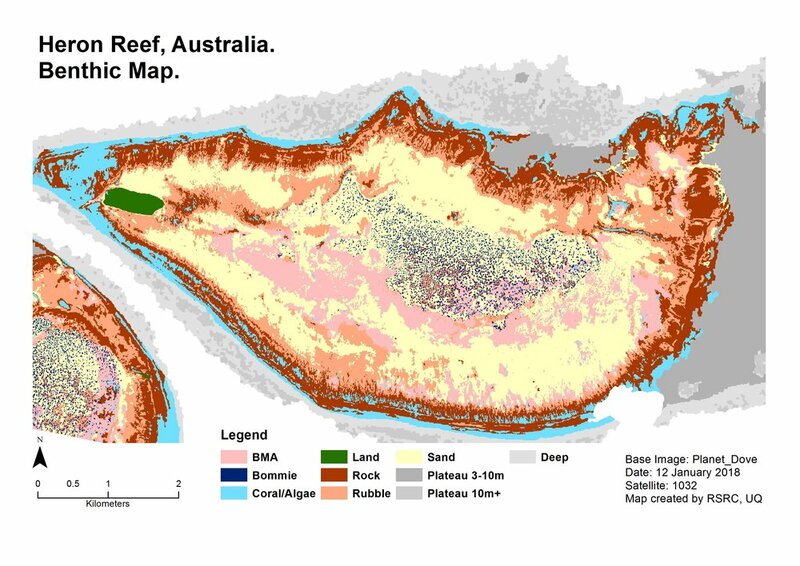 Geomorphic and bottom composition maps are and will be available through the Allen Coral Atlas. Partner researchers include: Greg Asner (Carnegie Institution / Arizona State University), Helen Fox (National Geographic Society), Kirk Larsen (Vulcan) and Andrew Zolli (Planet).